Is there a connection between Stargate and Melania Trump’s speech? 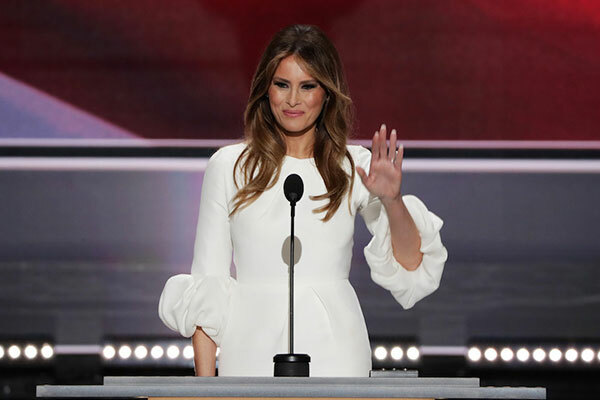 It’s shaping up to be a tough series of news cycles for the Trump campaign, with the bulk of media attention focused on allegations that portions of Melania Trump’s speech Monday night at the Republican National Convention were plagiarized from Michelle Obama’s 2008 convention speech. But here are two silver linings for the Trump team: At least no one is saying the passages were lifted from an alt-right/anti-Semitic source. And no one is talking about Stargate anymore. That said, they should be. Because there is a common thread between the flap over Melania Trump’s speech and the controversy over a tweet from Trump’s campaign lambasting Hillary Clinton as the “most corrupt candidate ever” featured a six-pointed star and a pile of money. Some of Trump’s critics wanted to make Stargate about anti-Semitism, especially after the millennial website Mic revealed the Twitter image had first shown up on message boards of the far-right, anti-Semitic alt-right movement. The more recent controversy, however, suggests the campaign is an equal-opportunity lifter (one week it’s an alt-right social media feed, this week it’s Michelle Obama). In both cases, we have a staffer seeming to lift material from another source in a way that ends up undercutting the desired message by turning the negative spotlight back on the campaign. And in each case the controversy was magnified by the campaign’s doubling down instead of apologizing, or at least conceding a mistake was made. Casting Trump as an anti-Semite was always going to be a tough sell given his embrace of his daughter Ivanka’s conversion to Judaism. Much more damaging to the Trump brand is the recurring narrative of staff incompetence and lack of accountability. Even before he jumped into the race, Trump wasn’t known for saying “I’m sorry” — but who knew it would be so hard for him to manage a well-timed “You’re fired”?